Over the next few weeks Bold ranged wide and far. He entered an area of human habitation - of farmland and scattered hamlets. He had attained his full size and was a splendid specimen of a male fox. He was well-built, muscular, with a beautifully healthy coat and brush; he was also clean-limbed and able to run quite tirelessly at a considerable speed. Though he had the sense not to stray too close to man-made buildings and dwellings, he had developed a fearlessness of his only real enemy which amounted to arrogance. His innate cunning and cleverness were more than a match for Man's. Inspired by this passage of Colin Dann's "The Fox Cub Bold" - one of his Farthing Wood novels - I painted this picture in watercolour. 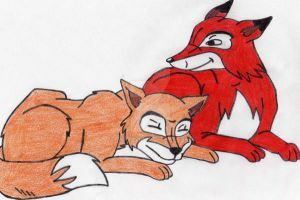 It was done in spring 2001, a period in my life when I rediscovered my intimate love for foxes and Bold. I never really used watercolour before (indeed, this was my very first "real" picture ever), it was just a test and its far from perfect, but I like it very much. Very big (60*90 cm), I was only able to take a photo of it. EDIT: Uploaded a new and much better photo. Over here in Germany recently all three series were released on DVD. They are with german and english audio. Oh yes poor old VHS do not last forever... I'm sure you will find some. Otherwise I may send you links to the german ones. he is so wonderfull,i love this poor bold soo much....i 'll never forget him!! in spite of it, you done an awesome work,as ever^^!!!! Yepp, Bold is the best one! I LOVED this character in the animated series. Sad ending too. Nice how you gave him his real colours as opposed the the bizarre peachy colour the animators gave him. hiiiii bold-chan is so cute like iiit ^^'!! Ehrlich gesagt- mir gefällt der Hintergrund besser als der Fuchs selbst =3 Liegt daran, dass ich selbst nichts konkretes auf die Reihe bringe. Im Übrigen aber sehr sauber gemacht. 2001 also? Damals hab ich Pokémon gezeichnet...wo die aber jetzt alle sind..? xD Jedenfalls Hut ab, sowohl zu Bleistift als auch zu Pinsel. Gepanscht? xD Müsstest mal meine ersten Werke sehen... X) Wobei, die neuen sind nicht viel besser ^^"
Btw, haste nicht noch 'ne Note von mir? The colors and background are so lovely. Naja das war mehr sowas wie ein erster Versuch XD Aber ich freu mich sehr, dass es dir gefällt! Theres not enough Farthing Wood fan art on the interent, it's never given the credit it deserves! Lovely piece, I look forward to seeing some of your more recent stuff! He reminds me of Plucky.